Looking at Highlands NC homes online is different than in person. Of course this is not news. Looking at a picture is always different than the real life experience. The truth is that some homes look better online and others are not nearly as wonderful in pictures as they are in reality. While it goes without saying that you would never buy a house without seeing it in person, take the time to visit Highlands NC homes for sale and you will quickly whittle your list down. The internet is a great placebo start a Highlands NC property search. The web allows for a great deal of information to be gathered. It also offers access to homes that are currently listed for sale. You can learn about neighborhoods and communities in the greater Highlands NC area and tour homes virtually. This online search can help you uncover what you like and what you don’t like. Your Highlands NC REALTOR will be an invaluable resource in your home search. Take advantage of this and schedule showings in person. The online experience cannot replace the opportunity to open doors and drawers, witness the size of rooms, and sit on the deck to breathe in the mountain air. 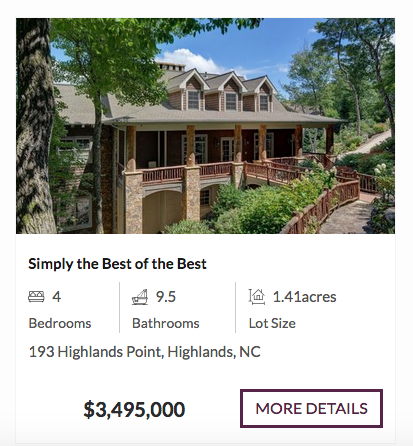 Contact our team at Berkshire Hathaway HomeServices Meadows Mountain Realty today to learn about buying Highlands NC real estate. We welcome the opportunity to update you on market conditions while getting you started on your property search. 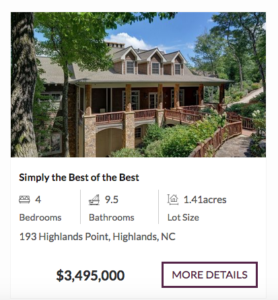 Let our knowledge and experience serve as your guide to the buying process, helping you understand the difference between looking at Highlands NC homes online and in person. Click here to read “What You Should Really Know About Browsing for Homes Online” from House Logic.